04. What messages should I be sending? The secret to a good onboarding messaging campaign is to send the right message to the right person at the right time, based on a user’s activity with your product (or lack thereof) rather than a cookie-cutter series of messages that’s blasted out to everyone on day 1, day 5, day 14, etc. One of these messages in isolation won’t deliver engaged users overnight. But a series of onboarding messages will help get new signups on the road to success and remove any stumbling blocks they might encounter along the way. Aligning all those elements to get everything right takes deliberate effort and planning. That can seem daunting when you think of all the flows and steps and people involved. So in this guide, you’ll learn how to cut through the confusion to plan and create a great onboarding messaging campaign. To continue learning about onboarding your customers, and gain access to all future starter kits, enter your email below. You can set a goal using any piece of data in Intercom, whether it’s an event or a user attribute. For example, your goal could be to get users to send 10 messages, or to complete their first project. Some of your onboarding messages, such as your welcome message, are mission critical. Other messages only need to be sent when someone isn’t using your product. Make sure your campaign prioritizes which message gets sent first. 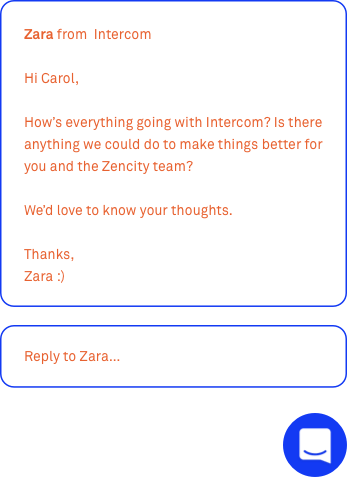 To choose which message to send first in Intercom, just drag and drop it to the top. Onboarding is no time to be shy. But you also need to make sure you’re not over-messaging your customers. Decide how many days you would like to leave in between messages (we recommend a minimum of 2 days). This prevents you from annoying customers with new messages when they haven’t even had a chance to act on the last one. The best behavior-based messages feel personal, not spammy. You can trigger messages based on actions people take in your product (e.g. hasn’t used feature X), on the outcome of other messages (e.g. hasn’t opened welcome message), or time passed since an event (e.g. hasn’t logged in for 14 days). 04 What messages should I be sending? The most impactful next steps for them to take e.g. send a message or add 5 teammates. The three most common questions customers have on the first day. Address them right up front so they don’t have to hunt around for the answers. Should you welcome new users through an in-app message or email? Probably both. Right after signup is one of the occasions when a user is expecting to receive an email from you, so make it count. Similarly the first time someone logs into your app is a great opportunity to set them on the right path and show the features most likely to convert them to being a lifelong happy customer. 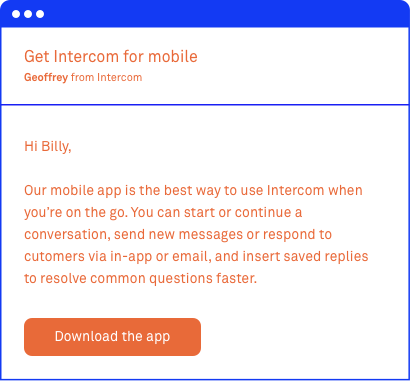 Rest assured, if you’re using Intercom to deliver your onboarding campaign, your messages will only be delivered to the first channel your customer opens. Your brand new users are unfamiliar with your product and will definitely have questions.  Create a “Getting Started” guide that’s brief, clear and proactively answers those questions. It should only include the bare essentials to start using your product, e.g. installing, configuring, using your key features etc. It should not be an exhaustive list of everything they could do on day one. Even better, create a short video to walk your customers through your key workflows. When you simultaneously show and tell with video, ideas are communicated and understood quicker. Once you’ve sent your welcome message and new signups have had a chance to explore the product, a getting started guide is your best chance of nudging uncertain users into action. You don’t want to send this message to people who are already making good progress in your product so consider adding filters around usage of some of your main features. The seeds of churn are planted early. Very often it’s during those all-important few days between when a customer has signed up but before they’ve used that killer feature all your successful customers are using. For example, if your product is a dating website and you know someone hasn’t sent a message yet, you also know they stand a very poor chance of finding romance. And if they don’t find romance soon, they’re going to churn to a competitor. That’s why one of your first onboarding messages should be designed to get people using the key feature you’ve identified. And if you are trying to change behavior in the app, a well-timed in-app message is going to be more successful than an email which gets filed “for later”. Set up a message that triggers to all new users who haven’t carried out the step you want them to take 2 days after sign up. Your filters here would be something like “Signed up more than 3 days ago” and “Project created is false”. By getting new users to integrate your product across multiple platforms, you’re increasing the likelihood your product will become a recurring part of their lives. For example, new Dropbox users who fail to install the mobile application won’t experience the full value of being to access files anywhere. They may upload fewer files, use less space and are less likely to pay for more storage. Target with intention. Yesterday’s signups are unlikely to be as ready to form a habit as a group of users that are regularly logging into your product and using it. For example, if you have a photo sharing app, target a segment of engaged users with this message (e.g. those who signed up less than 30 days ago and who’ve shared more than 50 photos). Encouraging users to build shared connections in your software is one of the best ways to fast-track engagement and reduce churn, especially for collaborative, team-based products like Asana, Intercom and Slack. Getting an individual user up and running with your product is a great start. Getting a whole team to rely on your product is even more powerful. A good onboarding campaign knows when to bring other people into the fold. You should only ask new signups to invite colleagues or teammates once they’ve reached a milestone, or indicated they’re sufficiently engaged with your product. (e.g has used a feature X amount of times, has imported custom data etc). Making such a heavy “ask” too early in the relationship will likely mean your request will go ignored. Invited teammates or friends require a unique onboarding message. Make sure your invitation emails contain 3 key pieces of information: who invited the user, what the product is, and a call to action to create an account. If you’re not continuously showing your customers how to get value out of your product, you’re not encouraging product dependency. You’re leaving the door open for someone else to come in and persuade them their product is more valuable than yours. The best onboarding retains customers over time by continually showing them how to get the most out of your product. For example, let’s say somebody has been using your product for six months. They’re engaged and up to speed. But then you release a brand new feature that can help them perform their job even better. This is a perfect opportunity to send a targeted in-app message that gives them a high-level overview of the feature and instructions to get started. Think about where it makes the most sense to announce new features to active customers. For example, if you’ve just released a new sync reports feature, a good place to tell your customers about it would be on your reports page. There’s no universal definition of a fully-onboarded customer; it’s simply different for every company. However a good proxy to consider a customer onboarded is when they’ve achieved one or more successful milestones with your product. For example, if you’re a project management tool, a successful milestone could be “mark one project as complete”. If you’re a productivity app, it might be “more than 10 to-dos completed”. You can track any of these attributes in Intercom by setting them as your campaign goal before you set your messages live. Overall message engagement should also be a key success metric. Open and click-through rates will give you one perspective, but so too will setting goals for your individual messages in your campaign. Of those who received the “key feature” message, how many used the feature afterwards? Of those received the “habit-forming” message, how many downloaded the mobile app? Onboarding campaigns can also be measured qualitatively by talking and checking in with your customers regularly. You’ll understand whether they’ve achieved success with your product, and if not, what’s preventing them from doing so. Using email to nurture new users as they begin to learn your product is one of the most important elements of user onboarding. At Proposify, we haven’t always done it as well as we could have. For starters, we weren’t targeting our emails based on whether or not someone was actively using the product. There was no activation metric we could use to say, “This person is on their way to becoming a customer” or, “This person signed up and gave up quickly”. Thanks to this excellent blog post by Groove on email onboarding, we developed our own workflow to send relevant emails to users based on whether they were active (completed the walkthrough) or inactive (didn’t send a proposal or complete the walkthrough). Secondly, we didn’t have the right tool for sending onboarding emails. In the past we custom-coded every email ourselves and used CRON jobs to send them out, but this didn’t work well. Often those of us on the product and marketing teams need to tweak emails, either the content or when they are sent, without needing to wait for developers to push the changes live. 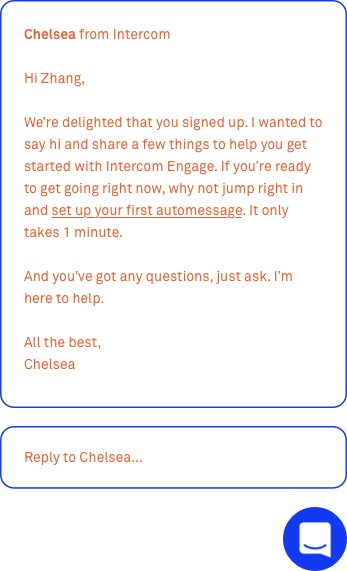 That’s when we started using Intercom’s Smart Campaigns feature to send our onboarding emails. Now our non-engineers are empowered to review and change the onboarding emails themselves, and we can see more clearly how many emails are being sent, opened, and clicked. 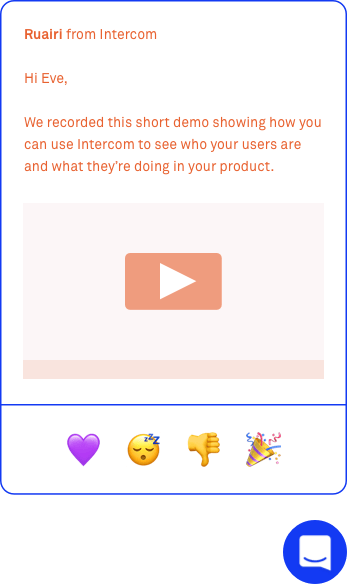 Here’s how the final onboarding campaign looks in Intercom. 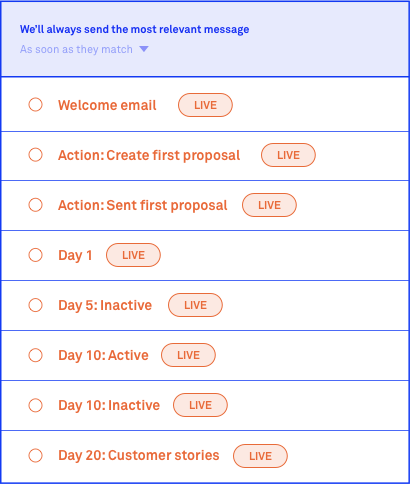 Now our in-app walkthrough and our email onboarding campaign work together to guide new users to become active, and our subsequent emails send unique messages to users based on whether or not they’ve become active. And as of Dec 1st, our trial to paid conversion has gone up 5%. There are a lot more steps to our onboarding, which means there are more chances for new signups to drop off. But our bet is that anyone who goes through our new onboarding process will have a much better understanding of what Proposify can do for them and feel confident they can successfully use the product to achieve their objectives.